120 WATT RMS 110 VOLT AC PUBLIC ADDRESS AMPLIFIER MIXER WITH 6 MICROPHONE INPUTS/AUX/AUTO MUTE. MAX OUTPUT POWER 180 WATTS. 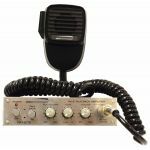 30 WATT RMS 110 VOLT AC PUBLIC ADDRESS AMPLIFIER WITH 2 MICROPHONE INPUTS/AUX/AUTO MUTE.